Chou doufu begins its life just like most other tofu, but then it gets fermented and something goes terribly stinky. I don’t really bother with how the tofu gets fermented, but why. Like why would anyone think it would be a good idea to ferment tofu? I suppose it has historical reasons similar to pickling and other forms of fermentation, which means it was just a method of preservation before the fridge came about. But however it happened, it happened and China has been smelling it ever since. Now you know that chou doufu can be found on the street, but you might be wondering on which streets in particular. The truth is that you don’t need to “look” for chou doufu, because if you have a decent olfactory sense, your nose will lead you there. Most recently, my olfactory sense led me to a chou doufu stand near the Yu Garden in Shanghai. It’s really hard to explain the smell of chou doufu, but rest assured it has earned its name. 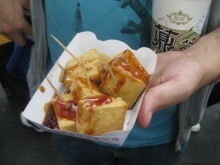 The Shanghai street-style of chou doufu is prepared with deep-fried rectangular cubes. Frying the tofu this way makes it easy to pick up with chopsticks or toothpicks and really if I can’t pick up tofu in this way, I probably won’t eat it. The result of frying it makes the tofu crispy on the inside, but somewhat spongy and juicy on the inside. The tofu is most often topped with a vinegar, sweet brown sauce or hot chili sauce. After the saucing, all you really have to do is hold your nose and dig in. You’ll find a taste that is far better than the smell, but it is not for everyone. In fact, the chou doufu I found near the Yu Garden disappointed me. Perhaps it had been fermented differently than I was used to, but I think it was because there wasn’t any hot chili sauce to put on it. Instead I was stuck with the sweet brown sauce, which did nothing to cover up the smell or enhance the flavor. Either way, it didn’t invoke the happy memories I thought it would. So whether it ends up being your type of thing or not, chou doufu is certainly something every visitor to China should try. You may not like it, but you will sure as hell like the taste better than the smell.